Ukuran pratayang PNG ini dari berkas SVG ini: 600 × 600 piksel Resolusi la'én: 240 × 240 piksel | 480 × 480 piksel | 768 × 768 piksel | 1.024 × 1.024 piksel. 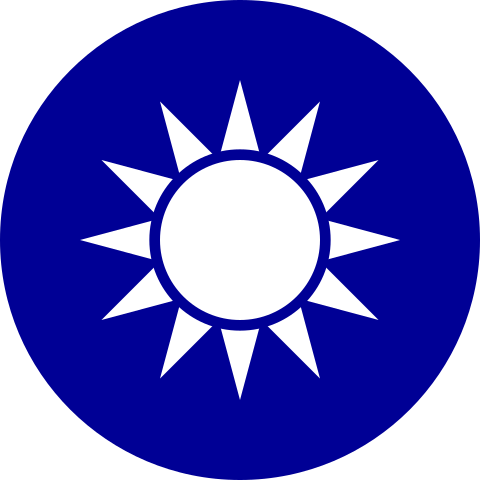 28 Buleuen Limöng 2018 01.45 600 × 600 (523 bytes) ZhangZihao This the colors used from the website of the President of the ROC. 8 Buleuen Siplôh 2017 20.05 600 × 600 (420 bytes) Lmmnhn Reverted to version as of 18:25, 22 November 2016 (UTC) It does not match the flag. 7 Buleuen Siplôh 2017 06.28 600 × 600 (2 KB) Wrestlingring Changed colors to match flag. 8 Buleuen Nam 2014 07.24 600 × 600 (533 bytes) Ericmetro Sekisama's version is C100-M60-Y0-K47, doesn't follow the MOI recommendation. Please see talk page for color conversion details.